The former Chinese Communist Party leader responsible for ordering the persecution of Falun Gong practitioners and the harvesting of their organs has become the target of current leader Xi Jinping’s purge of the Party. Jiang Zemin was forcibly removed from his residence by Chinese paramilitary troops in the early morning of June 10, according to a source in a security detail assigned to retired senior cadres. Jiang was last seen in the custody of senior military officers and persons in plain clothes in an old Beijing Military Region compound. The order to seize Jiang was issued by the regime’s top military governing body and was executed with extreme secrecy, according to the source. If this report proves to be accurate, the arrest is the culmination of a more than three-year anti-corruption campaign that has systematically uprooted the sources of Jiang’s power. Even if the report is somehow premature—perhaps Jiang was just brought in for a “chat”—the targeting of Jiang Zemin is nonetheless clear. Recently, the anti-corruption campaign has zeroed in on those closest to Jiang. Jiang’s elder son is under house arrest, and this spring the Party’s internal disciplinary agency conducted a massive sweep of Shanghai, Jiang’s longtime power base, targeting institutions that have ties to Jiang and his two sons. All along, Jiang’s allies and their cronies have continued to be purged. On July 20, 1999, Jiang Zemin ordered the regime’s security forces to “eradicate” the practice of Falun Gong. “Ruin their reputations, bankrupt them financially, and destroy them physically,” the police were instructed, according to many accounts from Falun Gong practitioners who heard these words firsthand. “At the time, it was Chairman Jiang. There was an instruction to start this thing, organ transplantation,” said Bai Shuzhong, the former health minister of the General Logistics Department, to undercover human rights investigators last year in a telephone call. Bai, speaking at a time of political upheaval, had been led to believe that he was speaking to internal Party investigators. Harvesting the organs of Falun Gong practitioners appeared to be the ideal fix to satiate Jiang’s blood lust—the persecution had already disenfranchised and demonized Falun Gong practitioners, and their incarceration in the hundreds of thousands guaranteed Chinese hospitals a steady supply of fresh organs to generate profits from. Having taken this course, however, Jiang couldn’t let go of power. If he was found guilty of issuing an order that resulted in the murder of thousands, tens of thousands, hundreds of thousands, and then finally millions of his fellow countrymen, he could face charges of genocide and crimes against humanity. According to an updated report on organ harvesting by researchers David Kilgour, David Matas, and Ethan Gutmann, 60,000 to 100,000 transplant surgeries have been carried out annually for 16 years, for a range of 960,000 to 1.6 million. Given the tendency of the Chinese medical system to use only one organ per donor, and in general to have great wastage, this number of transplants could result in hundreds of thousands killed. But if those whose hands were also stained with blood held the reins of power, Jiang could still hope to see Falun Gong destroyed, and he could enjoy impunity for his crimes. So Jiang promoted those who perpetuated his persecution, played at Party godfather after relinquishing all official titles, and remained the de facto power in China. Jiang Zemin and his faction dominated the 10-year reign of his successor Hu Jintao. Hu presided over a Politburo and its Standing Committee that was stacked with Jiang’s loyalists. Men like former security czar Zhou Yongkang and Central Military Commission vice chair Xu Caihou became power centers unto themselves. Hu’s orders and directives frequently failed to be heard beyond the gates of Zhongnanhai, the official residence of the Party elite, according to reports in overseas Chinese-language media. Operating virtually under Jiang’s thumb, Hu appeared wooden and stilted to foreign observers. The Falun Gong issue could serve to breach the Jiang Zemin problem because he can’t escape responsibility this way. Because Xi Jinping appeared to be cast in the same mold as Hu Jintao—pliant and nonthreatening—Jiang agreed to his succeeding Hu in 2012. The plan was for Xi to serve as an interim head until Bo Xilai, a Politburo member and Party chief of the southwestern megalopolis Chongqing, was able to take the top position. In Jiang’s eyes, Bo was the perfect character to rule the regime. “You must show your toughness in handling Falun Gong … it will be your political capital,” Jiang once told his political client Bo, according to veteran Chinese journalist Jiang Weiping. Under Bo’s five-year rule of Chongqing, there were over 700 Falun Gong persecution cases (given the difficulty of getting information out of China, that number is likely to be very understated), according to Minghui.org, a clearinghouse for firsthand information about the persecution. In the early 2000s, Bo Xilai was governor of northeastern China’s Liaoning Province, which researcher Ethan Gutmann has described as the “epicenter” of forced organ harvesting in China. In 2006 in a suburb of Liaoning’s capital Shenyang, the first credible reports of forced organ harvesting from Falun Gong practitioners emerged. In addition, businesses that plastinated—preserved by replacing body fluids with plastic—the bodies of executed prisoners for sale or display grew up in Liaoning during Bo’s rule. Bo’s ambition proved to be his downfall. Wang Lijun, Bo’s ally and former Chongqing police chief, after he failed to defect at the U.S. Consulate in Chengdu, disclosed to Party Central a plan by Bo and security czar Zhou Yongkang to unseat incoming Party leader Xi Jinping in a coup. 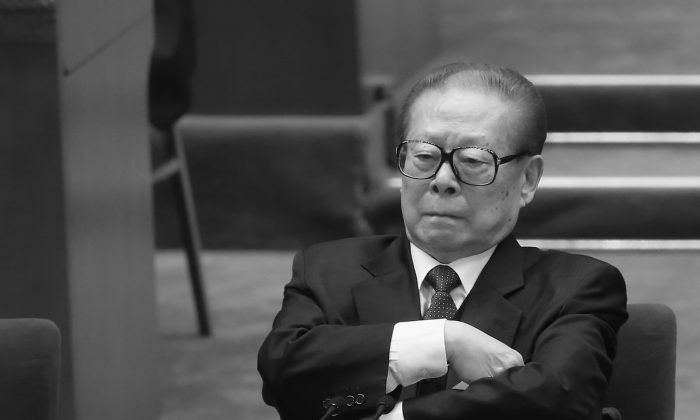 Jiang’s cronies forced Xi into a position of “you live, I die,” and upon taking office in November 2012 he began moving to uproot Jiang’s power. As the anti-corruption campaign launched by Xi Jinping swept through the Party’s political organs and economic sectors, thousands of cadres connected to Jiang Zemin’s political network were arrested. Li Dongsheng, the former public security deputy minister and head of the “610 Office,” an extralegal organization founded on June 10, 1999, to oversee the persecution of Falun Gong, was one of the first persecutors to fall. Next to be purged were “untouchable” characters like Zhou Yongkang, former General Office and United Front Department head Ling Jihua, as well as Xu Caihou and Guo Boxiong, the former vice chairs of the regime’s top military governing body. Near the end of May, overseas Chinese media announced the arrest of close associates of two military generals deeply involved in persecuting Falun Gong. When Xi’s forces have moved against high-profile targets in the past, they quietly detained them first and only brought charges against them when the moment was judged ripe. If the handling of Jiang Zemin’s case follows this pattern, public charges may be months away. Up until now, Xi’s political interests have been served by taking down those responsible for the persecution of Falun Gong. When Jiang Zemin is charged, Xi will face a moment of truth—whether to end that persecution. The most obvious reason that Xi Jinping can use to take down Jiang is the crimes he committed against Falun Gong practitioners. “The Falun Gong issue could serve to breach the Jiang Zemin problem because he can’t escape responsibility this way,” said Xin Ziling, a former defense official with connections to elite cadres with moderate leanings. Whether Xi will end the genocidal persecution of Falun Gong is not clear, but there are signs that he has opposed it. In January 2014, Xi closed the regime’s labor camps, key sites used to persecute Falun Gong practitioners. Under Xi’s leadership, the regime’s highest prosecuting body has accepted over 200,000 criminal complaints by Falun Gong practitioners against Jiang Zemin; two practitioners who filed legal complaints against Jiang during his reign were subjected to cruel torture, and one died from his injuries. When the former public security minister Li Dongsheng was arrested, his role as 610 Office head was publicized, the first time the regime officially acknowledged, in such a prominent manner, the existence of this secretive organization. The arrests or legal actions against key members of Jiang’s clique or their families also appear to be announced on or near dates that are significant to Falun Gong. For instance, security czar Zhou Yongkang was prosecuted on June 11 last year, while Jiang was said to be removed from his residence this June 10—the very date from which the notorious 610 Office got its name. This April, Xi made three reconciliatory gestures near and on the anniversary of April 25, the date in 1999 Jiang revealed to the Politburo his intentions to suppress Falun Gong following a peaceful petition in Beijing by 10,000 practitioners. Once the power of the Jiang Zemin faction is ended, China will enter a new era, and Xi, no longer burdened by factional opposition, can freely choose a new direction. If he ends the persecution of Falun Gong, this will be an unprecedented change in communist China. The Chinese people, free from the fetters of the Party, will finally enjoy liberty of conscience.